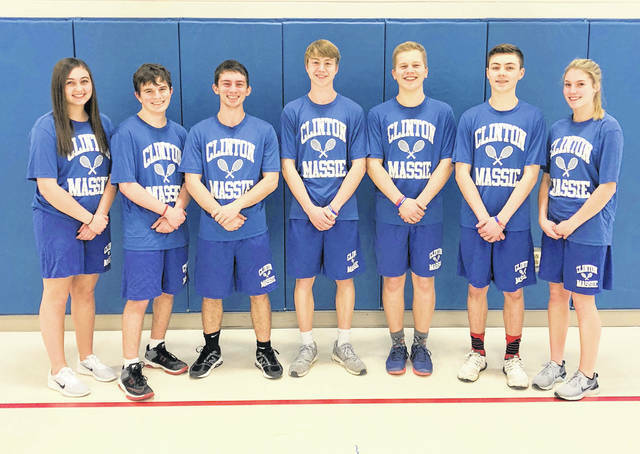 The Clinton-Massie High School tennis team, from left to right, Abbey Faucett, Barek Bennett, Jason Martin, Brennen Swope, Clayton Amburgy, Austin Faucett, Tyler Greathouse. Team member Caden Mckay was not present for the photo. Clayton Amburgy returns as one of the top singles players in the SBAAC in 2019. A 13-2 record last year, Amburgy will lead the Falcons this season as they look to improve on a 6-9 record and fourth place league finish. Joining Amburgy as returning players are Austin Faucett and Jason Martin. Coach Rod Amburgy, in his second year as head coach, said his team lost Zack Hammonds, Drew Keller and exchange student Leo Lentz from last year’s team. So the need to develop young players to fill in those spots will be key to the success of the team. Among the newcomers for the Falcons are Brennen Swope, Barek Bennett, Abby Faucett and Tyler Greathouse. Amburgy said Wilmington is the favorite to win the American Division title this season. https://www.wnewsj.com/wp-content/uploads/sites/22/2019/03/web1_TEN_cmteam.jpgThe Clinton-Massie High School tennis team, from left to right, Abbey Faucett, Barek Bennett, Jason Martin, Brennen Swope, Clayton Amburgy, Austin Faucett, Tyler Greathouse. Team member Caden Mckay was not present for the photo.